""A valuable compendium: broad In scope, rich In detail: It should be a most useful reference for students and teachers."" This is how Alex Inkeles of Stanford University described this text. It is made more so in this paperback edition aimed to reach a broad student population in sociology and psychology. 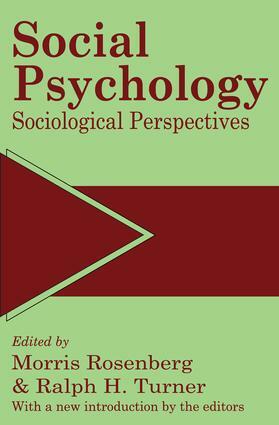 The new Introduction written by Rosenberg and Turner brings the story of social psychology up to date by a rich and detailed examination of trends and tendencies of the 1980s.Although social psychology is a major area of specialization in sociology and psychology, this text Is the first comprehensive and authoritative work that looks at the subject from a sociological perspective. Edited by two of the foremost social psychologists in the United States, this book presents a synthesis of the major theoretical and empirical contributions of social psychology.They treat both traditional topics such as symbolic interaction, social exchange theory, small groups, social roles, and intergroup relations, and newer approaches such as socialization processes over the life cycle, sociology of the self, talk and social control, and the sociology of sentiments and emotions. The result is an absolutely Indispensable text for students and teachers who need a complete and ready reference to this burgeoning field.